Since the birth of Islam the permissibility of music and singing has been debated. Not only the lawfulness of the performer but also of the audience was discussed. Advocates and opponents alike traced the legitimacy of their position back to the Quran and the hadiths, the sayings of the Prophet. As in present day Egypt, these debates on the lawfulness of music did not prevent the art from flourishing in palaces and private homes (Sawa 1989; Stigelbauer 1975). The seventeenth-century Muslim scholar Chelebi distinguishes three categories of music: that coming from birds, from the human throat and from instruments. He states that in Islam it is permissible to listen to the melodies produced by birds, and to those produced by the human throat, subject to certain conditions and rules. To listen to instruments that are blown or struck however, is never permissible (1957: 38). Certain instruments are forbidden because they are supposed to incite drinking. The kuba, an oblong drum, for instance, is prohibited because of its association with drinking wine, licentious songs and dissolute people. With respect to the human throat, if it produces songs about wine and debauchery, it is not permissible to listen to them (ibid. : 39). 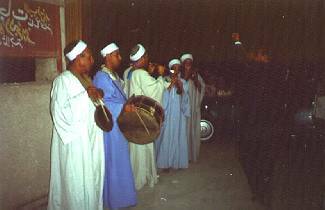 According to the ethnomusicologist Al-Faruqi, religious opinion makes a hierarchy of music and singing in forbidden, unfavored, indifferent, recommended and commendable forms. The recitation of the Quran stands at the peak of the hierarchy, immediately followed by the call to prayer and religious chants. Also legitimate are various types of songs connected to family celebrations, caravan chants, work songs and the music of military bands. At the bottom of the hierarchy, we find "sensuous music that is performed in association with condemned activities, or that is thought to incite to such prohibited practices as consumption of drugs and alcohol, lust, prostitution etc." (1985: 12). These genres are clearly forbidden, haram. Most forms of music and singing, though, fall between these clear categories and are controversial (Al-Faruqi 1985: 1-13). The approval or disapproval of performers is not only related to the genre but also to the context of the performance. Regarding the permissibility of the context, three elements are deemed important by the eleventh-century Muslim scholar Imam al-Ghazali, that is, time, place and associates. It is not acceptable if too much time is devoted to performances so that it interferes with the higher Islamic goals and distracts the believers' attention from the devotion to God. Full-time professional performers are accordingly less acceptable than non-professional amateurs. The acceptability of the place and occasion of the performance is also an important factor in judging the legitimacy of the entertainers and their public. Lastly, the type of people present during the performance affects the permissibility of the performers and their audience. A certain genre of music can thus be permissible in one context while it is rejected in another circumstance. Playing the tambourine is, for instance, acceptable if it is done by women at a wedding but forbidden if it is done by men in contexts of homosexuality or prostitution (Al-Faruqi 1985: 17-20; al-Ghazali 1902: 1). Religious discussions on dancing are less detailed and ma inly deal with the nature of ecstatic states of mind. According to al-Ghazali, proper conduct during ecstasy and trance is also bound by the rules of time, place and company. Besides, if ecstacy overcomes a person and makes the person move without volition, it is excusable. Yet, when volition returns, stillness and restraint is preferred. The general rule is that: "If the pleasure which causes dancing is praiseworthy, and the dancing increases and strengthens it, then the dancing is praiseworthy (...). Yet it is true that the practice of dancing does not befit the station of notable people who set an example, because most of the time, it springs from play and sport (...)" (al-Ghazali 1902: 9). We should keep in mind though that al-Ghazali discusses male ecstacy dancing in a religious setting and not female dancing in a secular context. Although the impact of gender on the acceptability of performers has not received systematic attention, it is a crucial factor in the debates outlined above. A well-known phrase often cited to discredit female singers, is "sawt al-mar'a `awra," "the voice of a woman is a shameful thing" (1). Imam al-Ghazali explains this as follows. Music is allowed except if temptation is feared. The voice of women could seduce the listener. Looking at female performers is always unlawful. Listening to the voice of concealed female performers is still forbidden if it evokes tempting images. He continues reasoning that looking at a beardless boy is only forbidden if there is a danger for temptation. He then likens the lawfulness of listening to a concealed female singers to looking at a beardless young boy. The rule which must be followed, then, relates to the arousal of temptation, and if this is feared, it is unlawful (1901: 235-237). Women are thus generally perceived as more enticing than men and excitement aroused by looking is considered more powerful than excitement aroused by listening. These observations have consequences for the lawfulness of the different forms of male and female performances. Female performances are more controversial and their acceptability depends on male experience of arousal. The fact that male excitement is most strongly aroused by the eye rather than the ear also affects the various categories of female performers. Female musicians have an audience. Female singers have an audience and, at least at present, spectators. Female dancers, on the other hand, are solely eye-catchers. Female dancing is accordingly considered the most shameful form of entertainment. In order to understand the Islamic fundamentalist views on art and entertainment we cannot solely rely on the opinion of Muslim scholars of the eleventh or seventeenth century, but should also look into recent religious opinion leaders. According to the late Sheikh al-Azhar Shaltut, who wrote a fatwa (a formal ruling or opinion) on the issue in 1960, music is permissible under certain conditions. He argues that God is not against pleasure and that Islam seeks the Golden Means. Yet, it should not take place under immoral circumstances or with dissolute companions (Al-Faruqi 1985: 25-26). The Muslim scholar al-Qaradawi states that singing and music in itself is permissible and pleasurable. He places several restrictions on them though. The content of the song should not be against the morals and teachings of Islam or be accompanied by other forbidden things in Islam like alcohol. Also the way of singing should be within the confines of Islam, that is, it should not be accompanied by suggestive movements. Exaggeration is never preferable but certainly not in entertainment and the person who knows that entertainment easily excites him or her should keep away from it (Qaradawi 1985: 139; 289). During my research, the leading television preacher Sheikh Mitwalli al-Sha`arawi, stated that all female dancing is bad and that only music which does not "tickle the nerves" is permissible (The Economist 21-5-1988). Most forms and contexts of art and entertainment in present-day Egypt are thus either controversial or forbidden, particularly for women as performers. So, although the Islamic fundamentalsts are the ones who actively try to abolish art and entertainment, their views on the unlawfulness of art and entertainment, especially for women, are shared by conservative and orthodox Muslim scholars as well. Why, then, are the voice and body of women considered forbidden things in Islam?